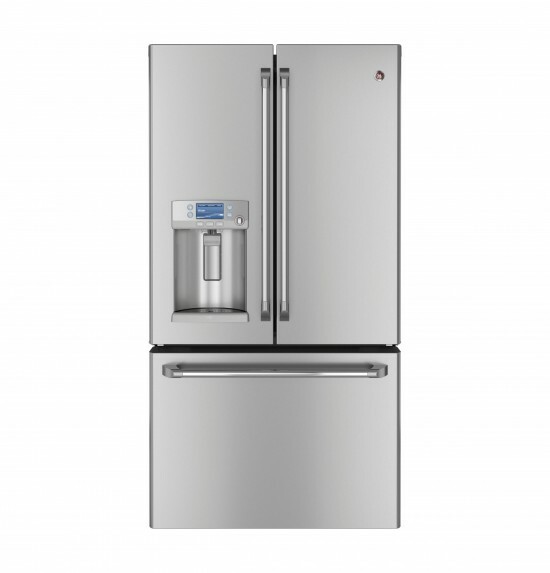 Samsung’s T9000 RF23J9011SR Refrigerator is the counter-depth version of its popular 34 cu. ft. French door refrigerator. The 23 cu. ft. refrigerator features Triple Cooling System technology, which creates three separate airflows in the refrigerator and freezer, enabling optimal humidity and individual temperature control per each compartment for outstanding freshness. A versatile, bottom-right door can be a fridge or freezer, maximizing fresh food storage space. . The Cool Select Plus features 4.43 cu. 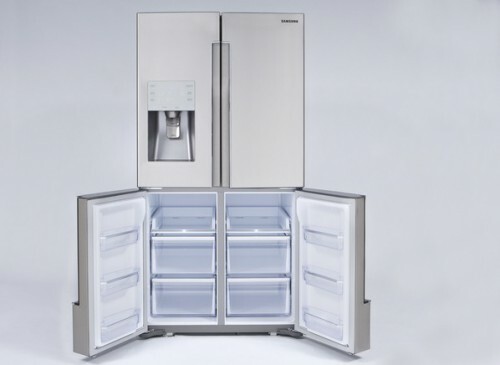 ft. of fresh-food storage and includes four customizable temperature settings: Fridge (41 F), Chilled (30 F), Soft Freeze (23 F), and Frozen (-9 to 1 F). It boasts the most fresh food storage available in its class at 18.05 cu. ft. when the Cool Select Plus is used as a refrigerator. Other features include an external water dispenser, slide in/flip-up shelves , a door open alarm, a built-in water filter, two crisper drawers, ice storage in its refrigerator and digital controls on its front door that show actual temperature. The counter depth T9000 will be available in spring 2015. In April 2013 you will be able to get the New GE Café™ French Door refrigerator that will be able to dispense both chilled and hot water. 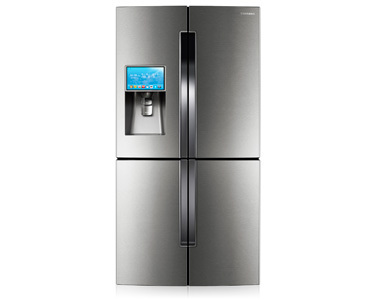 A refrigerator that heats water is an industry first. 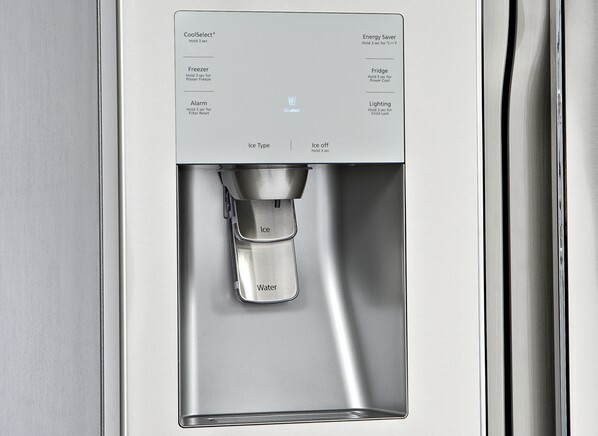 GE offers a unique solution for homeowners who don’t have much cabinet space under the sink for a hot water dispenser. The dispense is not an Instant Hot. You will have to wait a few minutes according to GE. Four pre-programmed options will be available from the door panel or you can select a custom temperature. Since the dispenser opening is large enough to set a mug and walk away, I can see how this might appeal to a busy mom who wants to steep her tea while she’s getting her children off to school in the morning. The Home Entertainer’s Ultimate Refrigerator – Really? 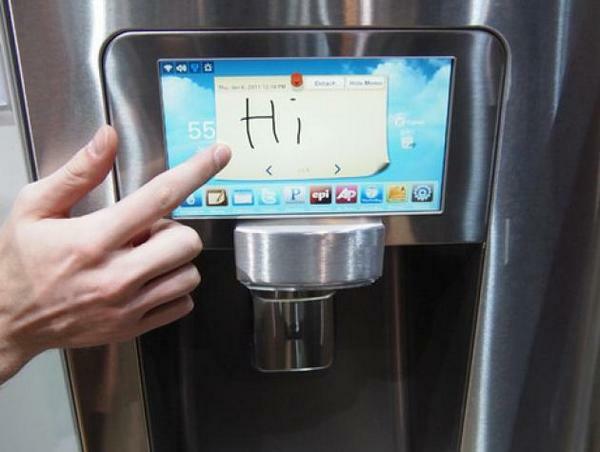 At the 2013 CES show Samsung decided to throw their hat in the ring with other manufacturers who have shown Refrigerators with touchscreens. The 32 cu. 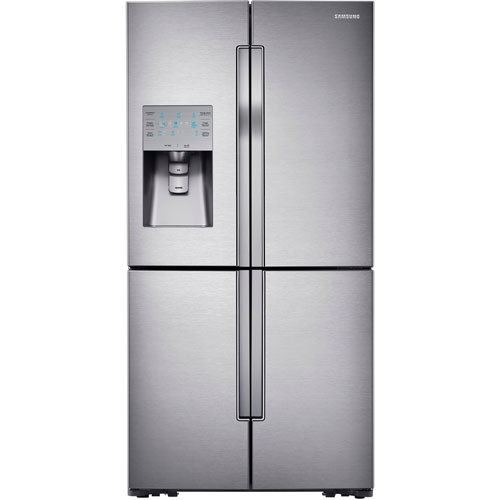 ft. capacity Samsung T9000 LCD Four-Door Refrigerator represents the next evolution in refrigerator design, with a new form factor that delivers the most fresh food storage in its class according to Samsung. The top compartment is a refrigerator with 19.4 cu. ft. capacity French Door compartment. The bottom left is a 6.1 cu. ft. freezer. The bottom right side can be either refrigerator or freezer depending on your personal needs. The refrigerator also comes with apps to help families stay connected and organized. Whether you’d want your Calendar and Weather apps on your kitchen appliance is up to you. Samsung seems proud to offer Evernote integration. While I love the app, I can’t help but imagine all the smudges you’d have on the screen. No pricing is available yet for the refrigerator but the touchscreen-less model out in the spring will be around $3,999.